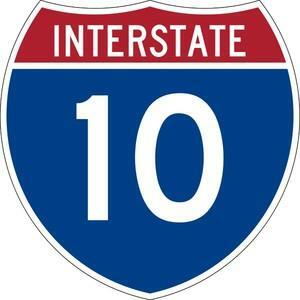 · I-10 Eastbound will close at North Mesa Street (Exit 11). Detour: Motorists will exit at North Mesa Street (Exit 11) and will be able to re-enter I-10 Eastbound at the downtown Wyoming Avenue entrance ramp. · The Sunland Park Drive overpass at I-10 will close in both directions. · Both Sunland Park Drive entrance ramps to I-10 Eastbound will close. Crews will be constructing bridges in several locations inside the GO 10 project limits. Note: This closure happens in conjunction with a different closure of I-10 Eastbound, which starts at Executive Center Boulevard and is being conducted by the Mesa Park Project. Information about the Mesa Park Project can be found on Twitter @TxDOTelp or by calling the Texas Department of Transportation at (915) 790-4341.